Autobacs Racing Team Aguri claimed pole position in qualifying on Saturday ahead of the 300 km Super GT race at Suzuka. Tomoki Nojiri and Takuya Izawa posted a best time of 1:44.319 in Qualifying 2, breaking the lap record by over two seconds in their No. 8 Honda NSX GT. 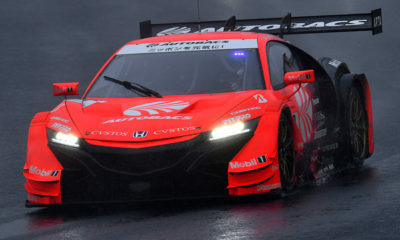 Jenson Button and Naoki Yamamoto will start from second in the Team Kunimitsu Honda, while Okayama winners Koudai Tsukakoshi and Takashi Kogure qualified third. The fastest Lexus LC 500 was the Lexus Team KeePer Tom’s car of Ryo Hirakawa and Nick Cassidy in fourth, while Jann Mardenborough and Daiki Sasaki were the quickest Nissan pairing in sixth position. Yuichi Nakayama took the GT300 class pole in the No. 96 K-Tune Racing LM Corsa-run Lexus RC F GT3. His best time was a 1:55.531 in Q2, beating the Tsuchiya Engineering Toyota 86 MC. The race gets underway at 2:40 p.m. local time on Sunday.